Villa Primavera Montgomery is located on the beautiful, tree-lined Boulevard Saint-Michel. The boulevard separates the municipalities of Etterbeek and Woluwe-Saint-Pierre. The high social standing of the area makes it a privileged place for businesses and embassies. It is 2 metro stops away from Schuman station (EU Commission) or a pleasant 15-minute walk across the Jubilee Park. 1.1 How to reach the European district ? 1.2 How to reach the historical and shopping centres ? How to reach the European district ? European Union insitutions are located just on the other side of Jubilee Park (Parc du Cinquantenaire). The EU Commission district is only two stops away by metro (line 1 or 5 until Schuman). Bus No 36, just around the corner of the residence, makes the journey to Schuman in about 10 minutes. The European Parliament is best reached using bus 22 from Montgomery Station (special EU district bus, doing a loop around the EU institutions). How to reach Brussels' historical and shopping centres ? The touritic centre (around the Grand Place) is easily reached by metro (5 stops on line 1 or 5, until Central Station). A for the famous shopping streets, Rue Neuve is just one stop after Central Station (De Brouckère station), while Louise Avenue is best reached by (underground) tramway, using line 23 or 24 from Boileau station (pronounced "Bwalo", just in front of the house). One of Brussels' biggest shopping centres, the Woluwe Shopping Centre can be accessed easily by metro from Montgomery Station. Take line 1 toward Stockel and get off at Roodebeek (4 stops). Right-click to zoom in or out. 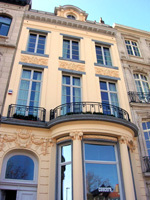 The Montgomery neighbourhood is one of the most expensive in Brussels. Montgomery Square, actually a huge roundabout with a tall water jet in the middle, is the junction between the prestigious Avenue de Tervuren, Boulevard St Michel, Boulevard Brand Whitlock and Avenue de Brocqueville. It is the boundary between the municipalities of Etterbeek, Woluwe-Saint-Pierre and Woluwe-Saint-Lambert. Etterbeek was the home of famous comic writers and artists, such as Hergé (the creator of Tintin), André Franquin (the creator of Gaston, Spriou & Fantasio, or Marsupilami) and Edgar P. Jacobs (the creator of Blake and Mortimer). Woluwe-St-Pierre is officially the most expensive municipality in Belgium. It also has the highest average salaries and lowest unemployment in the Brussels Capital-Region. Residents of the neighbourhood are lucky enough to have Passion Chocolat (Avenue Louis Gribaumont 20), which some connoisseurs sometime call the best chocolate shop in Brussels. It is a 5-10 minutes walk from Villa Primavera, on the other side of the Montgomery roundabout. There are three supermarkets (Delhaize, Fresh Med and Carrefour Market), two banks (BNP-Paribas-Fortis and Belfius) and 1 pharmacy within 2 minutes walk, in rue de l'Escadron (between the residence and Thieffry metro station). ING Bank has a branch behind Carrefour Market, and Deutsche Bank on the Montgomery roundabout. There is a postal service inside Carrefour Market. Next door is a Brico (hardware store). The nearest car rental agencies are Europcar at 538, Chaussée de Waterloo and Avis at 145, Rue Américaine, located a few hundred metres from each others, both in Ixelles. To get there, take tramway 23 towards the South Station ("Gare du Midi") and alight at "Bascule". Alternatively, if you don't want to walk, both companies also have a branch at the South Station. All these restaurants are within 10 minutes walk. Le Mess (International Fusion), Avenue Louis Schmidt, 1 - 1040 Etterbeek. Nouveau Saint Michel (Pub), Boulevard Saint-Michel, 129 - 1040 Etterbeek. The Open (Belgian, Italian, Thai), Boulevard Saint-Michel 17 - 1040 Etterbeek. Le Coach (Brasserie), Boulevard Saint-Michel, 20 - 1150 Woluwé-Saint-Pierre. Le Jardin de Nicolas (French), Avenue de Tervuren, 137 - 1150 Woluwé-Saint-Pierre. La Fin de Siècle (Italian), Avenue de l'Armée, 3 - 1040 Etterbeek. Le Buone maniere (Italian), Avenue de Tervuren, 59 - 1040 Etterbeek. Le Monde est Petit (French), Rue des Bataves, 65 - 1040 Etterbeek. Le Jaspe (Chinese), Boulevard Louis Schmidt, 30 - 1040 Etterbeek. Histoire d'un soir (French), Rue du Duc, 97 - 1150 Woluwe-Saint-Pierre. La Tribune d'Etterbeek (French) , Avenue de Tervuren, 105 - 1040 Etterbeek. La Baratte (French), Boulevard Saint-Michel 19 - 1040 Etterbeek. Friterie St-Michel (Kebab & chips), Rue de l'Escadron 21 - 1040 Etterbeek. Le Danube Bleu (Grill), Rue des Atrébates 13 - 1040 Etterbeek. Brasserie Yves (Brasserie), Avenue de l'Armée 41B - 1040 Etterbeek. Ambelis (Cypriot), Avenue de l'Armée, 41B - 1040 Etterbeek. Anis & Vanille (Asian), Avenue de Tervueren 113 - 1040 Etterbeek. Rich (International, Steak house), Avenue de Tervueren 105 - 1040 Etterbeek.